Students in the second and subsequent years are expected to take at least 3 units of graded graduate courses. As a consequence of the intellectual and research interests of the faculty of the group, there are two distinct academic lines for students to follow: (1) microbial physiology and genetics / applied and environmental microbiology; and (2) microbial pathogenesis, immunology and virology. Electives are not limited to this lists. Students can take other courses as electives provided major professor and academic advisor approval is given. At least 4 units or participatory seminars are also required. These are journal clubs and small-group seminars designed to engage students in an understanding of current literature related to and outside the dissertation research field. The best source of information about courses is the UC Davis General Catalog, which is available on-line (registrar.ucdavis.edu). In the UCD Catalog, relevant courses are listed under departments (note that departments in the schools of Engineering, Medicine and Vet Medicine are sub-listed under “E,” “M” and “V,” respectively, in the catalog) or under graduate groups (e.g. Genetics, Immunology). Graduate-level courses are numbered 200-299. Undergraduate, upper division courses are numbered 100-199. Many are good for background, especially in areas you might not have covered as an undergraduate. They will not count toward the requirement for 3 units of graded, graduate elective courses. Both graduate and upper division undergraduate courses are counted in your GPA. UC Davis Schedule Builder is an on-line course registration tool. Confirm the availability of graduate courses, which may differ from the listings in the General Catalog. Note: Students may also find the Research Ethics (RCR) Program very helpful even though it is not a registered course (http://research.ucdavis.edu/policiescompliance/research-ethics-rcr-program/). Participatory = students must participate by making a presentation during the quarter. Focus is on critical analysis of the scientific literature. May be a journal club, but must have a course designation and the student must present during the quarter. Offerings vary by quarter and year. Watch for e-mail notices each quarter. Check current class schedule and room directory on the registrar’s web site. 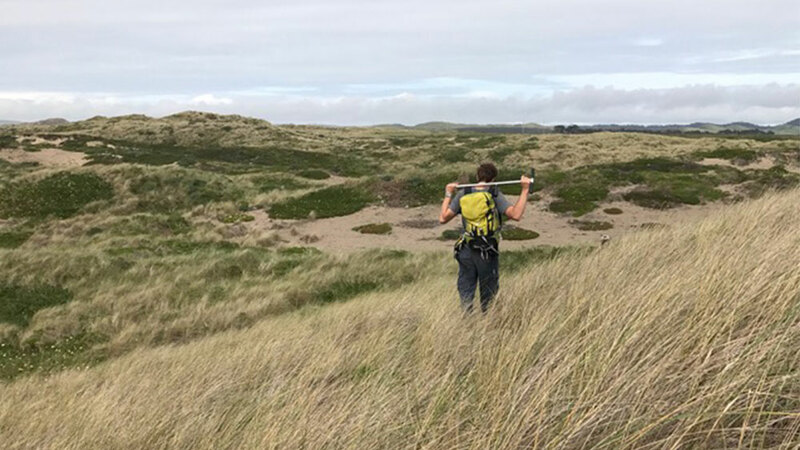 Hiking towards coastal dunes heavily invaded by European beachgrass (Ammophila arenaria) at Point Reyes National Seashore, California (Photo by Jordan Sayre, Rodrigues Lab).